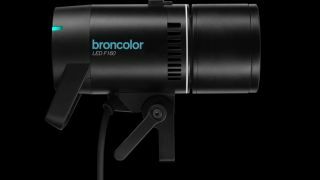 Joining the stack of announcements from Photokina 2018 is Broncolor, taking the wraps off of two new products focused on photographic lighting. This is the first Broncolor lamp to use an LED as its sole light source. It has a CRI (Colour Rendering Index) rating of 97, going up to 98.6 at 5500 degrees Kelvin, meaning that it’ll produce excellent colour accuracy. Its adjustable colour temperature settings range from 2800 to 6800 degrees Kelvin, and it’s capable of dimming from full output down to 10%, controlled via the rear OLED display. These increments can be set in full-stop or 1/10, as the user prefers. This lamp is designed to work in conjunction with other Broncolor lamps, thanks to its integrated broncolor Bayonet accessory mount and a precision-engineered diffusion element. It also has a spot flood mechanism built into its side that can be adjusted with one hand for easy, precise control of the beam of light. Broncolor also said that a future firmware update will add the option for Wi-Fi control. The Broncolor LED F160 is available for pre-order now, priced $1699. This is something interesting. A slightly complicated proposition, it’s billed as a ‘surface visualisation’ system, and was developed by Broncolor in conjunction with Swiss firm Truvis. Essentially, the Scope D50 uses 48 separate light modules to capture a series of 48 different images that are then merged in software afterwards. Each of these images is captured with a unique set of lighting parameters, and when these are blended together in Truvis’s bespoke software, it allows for significant post-capture adjustment and control of an image’s lighting. At a stretch you could call it a kind of ‘studio light RAW’ format. ‘No longer will a re-shoot be necessary if a new lighting style is required,’ says Broncolor – you simply use the software to make your adjustments to lighting style, direction, hardness and intensity. The firm also promises that the software will enable visualisation of object characteristics invisible to the naked eye under ordinary light, giving the device significant applications in research as well. Supposedly the Scope D50 supports any camera with flash-sync output. We’re looking forward to getting a closer look at one to get a better idea of what it’s all about, but we’ll have to wait a little while – it’s not due for release until 2019. Pricing is yet to be announced.